Gallipolis City Commission meets the first Tuesday of the month at 6 p.m. at 333 Third Avenue. 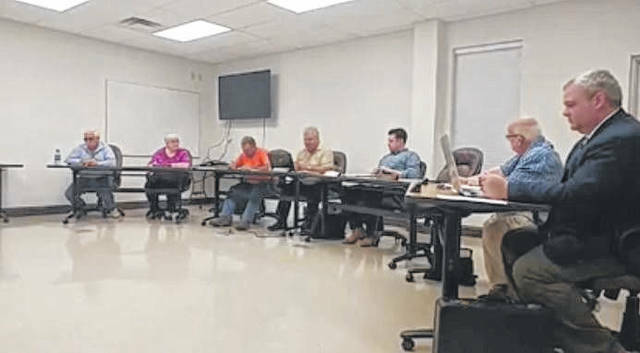 GALLIPOLIS — President of the Community Improvement Corporation for Gallia County Josh Bodimer approached Gallipolis City Commission Tuesday night during its regular meeting in hopes of garnering support for the potential of hiring an executive director for the CIC group. The CIC is an economic development agency consisting of area residents and business owners along with government officials with the aim of improving Gallia’s economic future. “We’re here to improve the community and form more partnerships,” said Bodimer. Bodimer said the group put together a strategic plan last year with the help of Bossard Memorial Library Director Debbie Saunders. Among its listed goals to accomplish by 2022, the group would like to improve recreational facilities in the region, create a new community center, eliminate the drug problem in the area, partner more with O.O. McIntyre Park District, improve area assets and public infrastructure development, develop high speed internet throughout the county, and other goals. Bodimer noted the Gallia Economic Development Office was taking part in site certification activities for parts of the Dan Evans Industrial Park, which has often been connected with CIC development goals. The CIC had sold land to Ohio Valley Bank for its recent efforts to develop its project “OVB on the Square” as well as supported Gallia Engineer Brett Boothe in a hunt for federal grant dollars to create a smart corridor along US 35. Gallipolis officials said they would consider the request however felt that with the drop in government funding to the municipality that the CIC may want to consider approaching area villages about funding the position of executive director as well. While Gallipolis is often referred to as a city in conversation, its population numbers technically render it a village by legal definition. Bodimer said he anticipated to meet with Gallia Commissioners as well. Reportedly, the CIC has not had an executive director over the span of “five (different) presidents” of the group said Bodimer. The group was attempting to hone its vision and goals and the addition of an executive director could help with that. Dean Wright can be reached by 740-446-2342, ext. 2103.